In this tutorial you will learn to create a new user (Matt), whose setup is similar to a user who has already been created (Brenda). While creating the new user, you will incorporate TT User Setup's copying features to duplicate elements of Brenda's setup and apply them to Matt's setup. Highlight the desired row(e.g., BTAYLOR), and click Copy. The Copy User - Options window appears. Any options that are not available for the currently selected user are disabled. For example, BTAYLOR does not have any direct trader or admin gateway logins. Select Copy TTORD Gateway Logins. 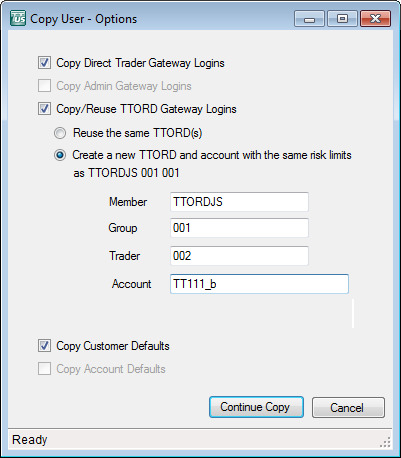 Select Create a new TTORD... to copy TTORD Gateway Logins as a new TTORD. Enter a new Member (TTORDJS) Group (001) and Trader (002). Because Matt has the same Member and Group as Brenda, they will share an order book. Enter an account number of TT111_b (Optional). Note: Beginning with TT User Setup version 7.17, account information is no longer required for gateway logins. However, accounts are required for TTORDs if applicable clients, servers, and gateways have not been upgraded to a minimum of version 7.17. The New User window appears and is populated with most of the data from the BTAYLOR profile. Notice, however, that the Gateway Logins have the TTORDJS 001 002 MGT but the same gateways and product limits as the gateways in the BTAYLOR profile. If you edit the Gateway Logins you will also see that the account number is TT111_b. Click the Customer Defaults tab. As requested, TT User Setup copied all of Brenda's customer defaults. However, you will need to update the account numbers to ones assigned to Matt. The Replace Account Numbers window appears. 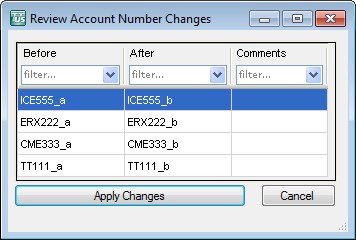 Configure the account replacement rules to determine how the existing account numbers will be replaced. In the Step1 section, check Remote characters and set the options to The first 1 characters. 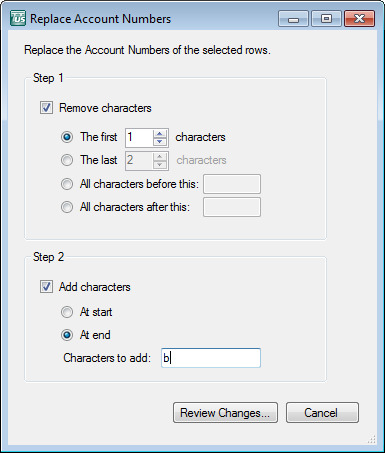 In the Step 2 section, check Add characters, At end, and then enter b into the Characters to add field. The Review Account Number Changes window appears. The account numbers are replaced. On the New Users Login tab, assign Matt a new Username and Display Name, edit any other applicable fields, and click Save. From the New User window, click Contact Information and add contact information. Note: In X_TRADER ASP, Country and Email are required fields. If you set Country to United States, you must set a zip code. You have successfully copied a user.